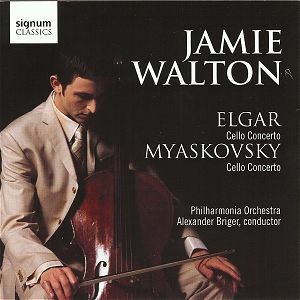 No sooner has Natalie Clein’s recording of the Elgar Cello Concerto left my reviewing desk than Jamie Walton’s arrives. Like Clein, Walton is a bit of a sniffer and the close recording picks up a number of anticipatory intakes of breath, albeit not as obtrusively as was the case in the Clein recording. The two performances espouse different approaches and traditions. Where Clein’s emotive playing can lead to metrical stretching, Walton’s is an altogether more understated and linear performance. He has a multi-variegated vibrato which he employs with consistent subtlety. The result is a reading of real nobility and refinement, one that illuminates the music from within, and that never stretches the material too far. He maintains tension throughout the concerto and revels in the very fast bowing of the scherzo; dextrous wrist and forearm control here as he dispatches the writing with illuminating rapidity but not superficiality. It’s actually terpsichorean. He never lets the slow movement’s tempo relax too far or slacken. His expressive shading is certainly deliberately circumscribed but it is exceptionally well characterised. In his avoidance of rhetorical gestures he reminds me of the great French lineage in this work – Fournier, Navarra and Tortelier in particular. The sense of lyric nobility is palpable and admirable. From 4:00 in the finale he really does drive forward – the only time I would even slightly baulk at tempo choices – but I sense this is of a piece; it’s to intensify the climax at 4:32, to hint at the hysteria within the writing. I’m also not quite sure about his smears at the very end. Otherwise I’m powerfully impressed by Walton’s playing and also by Alexander Briger’s thoroughly idiomatic conducting. He brings out the brass, and the lower strings in particular with outstanding eloquence though the recording isn’t always the most sympathetic. Briger is Charles Mackerras’s nephew, I believe. Since the Miaskovsky concerto is often described as “autumnal” it’s particularly apt that Walton has chosen to promote it with the Elgar. I’ve racked my brains to think of a faster performance of the 1944 concerto but I don’t believe I have. Walton’s even faster than Rostropovich in his Moscow/Kondrashin performance, now in a Brilliant box, and also the first ever recording, made with Sargent in London. Speed isn’t everything of course; sometimes it’s nothing. But Walton has mitigated those moments of structural weakness in the work that can lead some players to excessive lingering – I shudder to remember Rodin and his 1996 recording, which stretched into the dim distant horizon. This is a warm, sympathetic recording, that never wallows, that remains strongly directional whilst never stinting the many lyrical episodes. The wind solos are excellent and once again Briger distinguishes himself, setting a firm architectural goal. There’s no lingering in the first movement second subject – linear clarity allied to tonal warmth is the guiding principle underlying this performance. Don’t expect any gauche exaggerations either. This ensures the second of the two movements – the one that usually suffers the most from over-indulgent performers – is heard as an unbroken line with a basic tempo adhered to, not inflexibly, but with musical and structural insight. Of course there are other, more overtly expressive ways to play both these works. But Walton seems to me to belong to the Anglo-French school in his interpretative stance in both concertos; affecting but not lachrymose, noble but not unyielding. I happen to be sympathetic to his approach and consequently find his playing admirable. To those who want more juice in up-to-date performances Clein will offer it in the Elgar and Mørk in the Miaskovsky but neither seems to me at all superior to Walton.